Frederick, an Augustinian canon, rolls up the sleeve of the ivory white cassock and writes in the "book" of the Hospice: January 7, 2018. Snow on the ground, 5 meters and 58 meters. The first page is 200 years ago. The volume contains temperatures, snowfall, notes on rainfall and drought, winds. The Hospice is named after St. Nicholas of Myra on the will of those who built it, St. Bernard, remembered as the patron saint of the Alps. Frederick was yesterday the only one of the four canons who alternate during the winter to the 2,473 meters of the pass between Italy and Switzerland, Valle d'Aosta in the South, Entremont in the North. 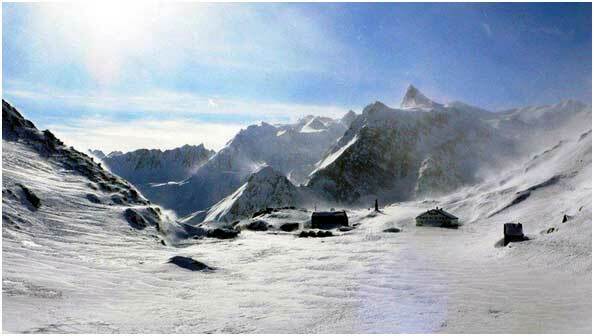 The hill of the Great St. Bernard is rich in history, since ancient times, and wind. Winter is snowy and the accumulations are impressive. Frederick: «From October to today we have reached over five and a half meters. And today it continues to snow ". It is the highest inhabited place in Europe and winter means isolation. "From what? ", Asks the canon, who is an Augustinian for 32 years, and is originally from Orsières, a small town in the Entremont, the last railway station before the border. He explains: "Here, normality is isolated. Today we are ten: an oblate nun, eight who take care of the guests and me ». "We have'nt seen for days. Too dangerous". In the "book" there is already a note: "At 16:00 hours of January 3, the gusts of wind reached 176 kilometers per hour". Those who once were travelers or pilgrims today are tourists-alpinists, with skis or snowshoes. There are still those who reach the hill to pray. The canons pray, work, host and offer comfort. "Even on the phone. We not only receive reservations to spend a period here or to know the conditions of the snow, but also requests for prayers - "Continue the Monk" - It is addressed to us who need goodness, words that can soothe their hard times. And we are here. Always". In winter, the famous San Bernard dogs are not here. In autumn they return to the Martigny breeding. They are here since the Roman times, molosses that came from the Himalayan highlands. They have helped the travelers over the centuries, as well as the soldiers of the snow, the "maroniers". Because the valleys of the San Bernardo are rugged. In the "book" of the Hospice there are also snow records. Federico: «In 1870 (tail of the small glaciation) 26 meters were measured; 24.74 in 1914. More than 20 in 1974, but the year after we have the smallest measurement measured, less than 10 meters. Last year the meters were 14. Among the curiosities of this place, where the snow is the protagonist, there is a chronicle of the abbot Rudolph of the Belgian monastery of Sainr-Trond: in 1129 he writes about an avalanche that between 3 and 4 January overwhelmed ten men, among pilgrims and locals. It is the first documented Alpine disaster.